The Kawero! 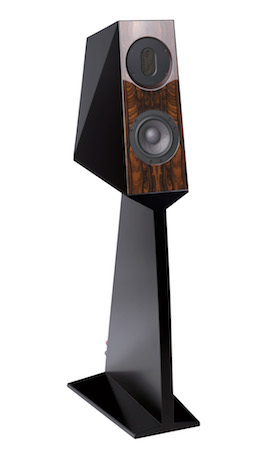 range of loudspeakers incorporates truly creative design features and has earned superb reviews and numerous international ‘best sound at the show’ comments from visitors over the years. The Kawero! 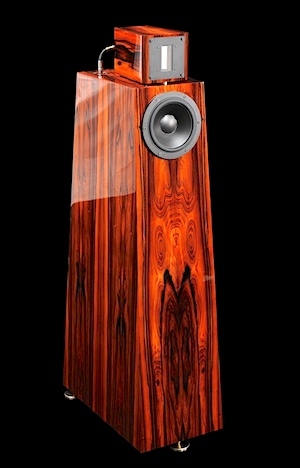 family offers a range of very high performance loudspeakers: two floorstanders – the original Kawero! Classic and the later Vivace – the Chiara stand-mount developed from them and now the Furioso stand-mount taking a different, lower-cost direction. The single most important feature in the three original designs is the cabinet material – Tankwood or Panzerholtz – which is incredibly dense and non-resonant. Developed to bullet-proof cars it offers the best possible ‘quiet’ enclosure for the drive units to launch accurate, uncoloured sound, undiminished by interference from cabinet resonance which would otherwise neutralise some music energy. With this trio of astonishing speakers you hear the recording uncoloured by the cabinet. 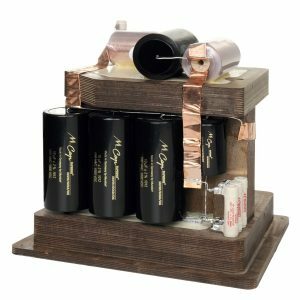 As it doesn’t resonate all listeners are astonished at the scale of sound this inert material allows all three to create, from compact cabinets. Why don’t other manufacturers use it? – because it’s a beast to fashion, blunting even diamond-tipped tools. Another key aspect of the design of all three is their integration with the room. The main bass-mid drive unit is connected directly to the amplifier – no crossover to lose detail and distort phase information – but additional drive units on the rear couple to the room in sophisticated ways (more below) for full power delivery, and hence natural voice and instrument tonality, across the frequency range. What’s special about the Kawero! range? 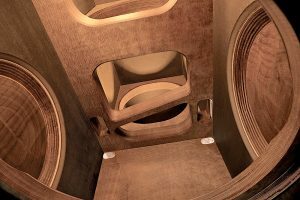 • Cabinets constructed from naturally-inert Tankwood, birch ply that is compressed under intense pressure to about half its original thickness and injected with resin to form a composite material with ideal acoustic energy absorbing properties, while having almost no sound signature of its own. Only a factory with the highly advanced CNC machines like those at Kaiser Acoustics can cut and form such complex cabinets in a material so hard that it blunts diamond tools. • There’s another more subtle but significant benefit of an inert cabinet, beyond lack of colouration: a vibrating cabinet interferes with the music signal, cancelling out some of its energy. It’s the reason all three Kaweros! perform ‘big’ beyond their size – power and scale from compact forms. • All models in the Kawero! range have a rear-firing passive driver, i.e. it has no electrical connection, that is acoustically-connected in a closed chamber to the bass/mid-range drive unit on the front. In this way the speakers, with some help from the rear bass unit, are designed to ‘couple’ to the room in a controlled way to fill in the ‘step response’ speakers can suffer as increasingly omnidirectional low frequencies ‘leak’ around the sides of the cabinet, causing cancellation. The Kaiser solution creates far more natural tonal colours, or timbre, of acoustic instruments and voices. • Vertex AQ vibration-draining and EMI/RFI technology can be specified for the Classic and Vivace crossovers and is built into the Chiara from the outset. Over many years hundreds of customers have enjoyed truly massive improvements to system performance from Vertex components, especially around the speaker/amplifier interface where signal damage from speaker-generated vibration can hobble even the most exotic systems. • Customers can choose almost any finish they wish, whether in colour, veneer or level of sheen, to blend into domestic furnishings or to make a design statement.